Lavish is the word that comes to mind when beholding God, Seed: Poetry & Art About the Natural World (Tebot Bach, 2010) by poet Rebecca Foust and artist Lorna Stevens. 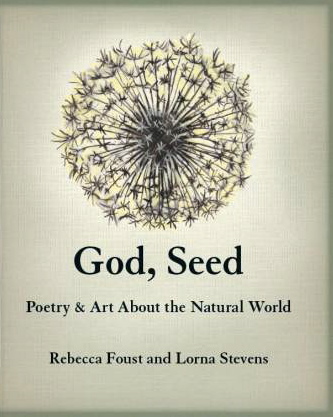 Well established in their respective mediums, Foust and Stevens’ collaboration in God, Seed is one of those felicitous combustions of text (forty-three poems) and illustration (thirty full-color images) that result in a brilliant hothouse hybrid. Readers should prepare themselves for sensory overload if not an outright short-circuit when experiencing a two-page spread of, say, Stevens’ lush eye-popping watercolor of a parsimmon opposite Foust’s sensual accompanying poem, “Parsimmons” (“ … rich river pudding, plush and pulp, / soft-slide swallow delight / and sweet, sweet”). Conversely, later on, we are chilled to the bone by Stevens’ austere black brushwork depicting galloping bison that mimics the timeless mysteries of a prehistoric cave drawing. Foust’s chastising poem is “Last Bison Gone” (“We love what we love / in the scientific way, efficient, empiric, / vicious, too much …). Thus are the contrasting poles of God, Seed established: rapturous pleasure in nature’s bounty on the one hand, while, on the other, rapacious misuse and abuse of all that humanity surveys. Rebecca Foust’s poetry has always struck at the heart of hard truths. Her first two tough-minded chapbooks (consecutive winners of the Robert Phillips Poetry Chapbook Prize in 2007 and 2008) were reviewed favorably in our online pages. Dark Card, Foust’s debut, shook a righteous fist at doctors and gods alike for the plight of her son, diagnosed with Asperger’s syndrome. Mom’s Canoe, the follow-up, bracingly recaptured the poet’s own childhood growing up in the depressed strip-mining region of western Pennsylvania.